HQ Trivia is an English spoken live video quiz that keeps millions of people glued to their mobile screens for a daily dose of trivia. As of November 5th, Dutch speaking people can get their their quiz kicks in their own language, playing Qwistet with radiostation Qmusic. The game is built, produced and streamed with Audience Engagement platform Zender. As Zender’s marketer, I was intrigued to see our technology in action ‘in the wild’, so I asked if we could get some pictures. 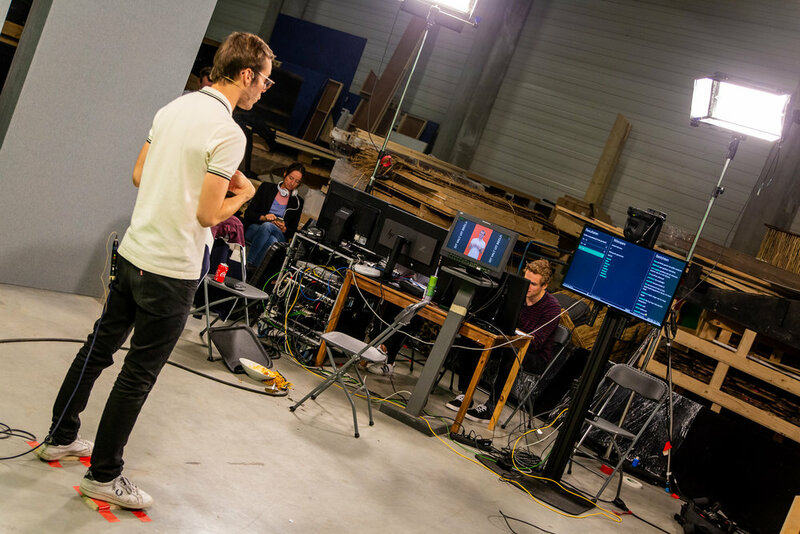 The nice people at Qmusic sent over a set of great photos, granting an exclusive view on what goes on behind the scenes of the live game show. My initial interest was to get a better view on how the Qmusic team works with the Zender editorial console. I also wanted to see how host Vincent Fierens works with the Zender presenter view, where he sees the information necessary for providing a fluent and swift live gameshow. As I got perhaps a little more than I bargained for, I want to share the photos with you. They’re insightful for the setup you need if you’re thinking about building your version of HQ Trivia, and they’re also good fun on a Friday afternoon. Vincent Fierens, quiz presenter extraordinaire, getting in the zone for today’s live show. On the right, the show’s director, triggering the questions and answers from Zender’s Editorial Console. On the left, the moderator selects the best comments in the chat which show up on the Zender’s Presenter View for the host to read. The magic of green key in action: a crew member plays along during the live trivia show. The director’s trigger finger ready to launch the next question. Do you want to build a live trivia quiz for your television network, radio station or online media brand? Request a Zender demo, no strings attached. Why are Live Game Shows on Mobile Phones So Popular? Qmusic, Flanders largest commercial radiostation launches live trivia quiz Qwistet with Zender.